An Air Zimbabwe (AirZim) plane failed to travel from the OR Tambo International Airport in Johannesburg after it ruptured its two rear tyres on Friday morning. The flight, Boeing 767, which was being flown by Captain Merna Cremer — wife to Zimbabwe cricket team captain Graeme Cremer — only managed to leave the airport the following morning. Cremer tweeted that the extended delay was “a result of uneven brake heating” in response to a question by a passenger that follows her on the micro-blogging site. AirZim corporate affairs and communications manager Tafadzwa Mazonde confirmed the developments in an interview with the Daily News yesterday. Mazonde said the beleaguered airline had to book its affected passengers into hotels around Johannesburg where they spent the night on Friday. “The plane could not travel due to a tyre incident but it finally came on Saturday morning. The passengers were given hotel accommodation on Friday night,” he said. Although Mazonde could not give further details on the cause and effect of the incident, the Daily News has gathered information from its reliable sources in the aviation industry that the incident could have been a result of poor fleet maintenance. “I understand that investigations are going on to establish the actual cause of the accident but preliminary investigations are that it could have been a result of poor maintenance on the part of Air Zimbabwe. “Double punctures are extremely rare and that’s why it is pointing to poor maintenance,” said a highly placed aviation source. It also emerged that the plane had just one spare wheel and had to wait for another plane to travel from Harare to Johannesburg with the spare wheel, which could only be installed on Saturday morning. 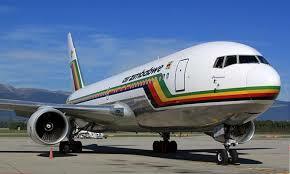 “They had gone with just one spare wheel and had to look for another flight from Harare to bring the other one. “Unfortunately, for the passengers, that other spare wheel was only delivered around 7pm in the evening on Friday and could not be fixed on time for the flight to take off, so they had to wait till the following morning,” the source said. The incident is the latest manifestation of the rot at AirZim, whose recovery prospects were recently declared to be dead in the waters by Transport and Infrastructural Development minister Joram Gumbo. In May last year, AirZim planes flights were barred from European Union countries after it failed to meet minimum safety expectations set out by the International Air Travel Association (Iata). Currently, the troubled airline is operating without the Iata certification and is limited to servicing local and regional routes, albeit with great difficulties. In November last year, Gumbo told Parliament that AirZim’s planes were “old and noisy” and added that its recovery prospects were very slim given its high indebtedness. At independence in 1980, the airline had 18 planes in its fleet, but today it is operating at less than a third of its all-time peak.